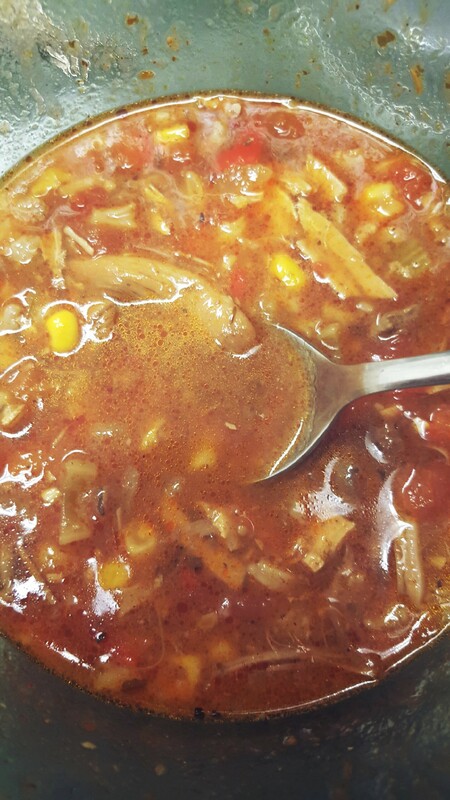 Soups on – Chicken Fajita Soup – Dancing in the rain! This is my new winter favorite and I wanted to share with you. I am terrible with recipes so I tried to make this as easy as possible. I just use the little of this and a little of that approach and hope for the best. Sunday I had actually made a roasted blackened chicken using American BBQ spice. I used some of the chicken and I boiled down the bones and spices and used two cups of the broth fresh along with the box of low sodium. I also used some heirloom tomatoes that were very ripe and were going to go to waste, I used them along with the canned diced tomatoes. This made a really flavorful soup. I hope you enjoy! 1. Heat oil in a large soup pot over medium heat. Place chicken in the hot oil; cook, stirring only occasionally, until brown, about 10 minutes. Sprinkle fajita seasoning or sauce over the browned chicken and stir well to coat. Add the red and yellow bell pepper, celery, garlic, and onion to the seasoned chicken. Stir and cook over medium heat until the vegetables are soft, about 10 minutes. 2. Pour the fire roasted tomatoes, black beans, and chicken broth into the pot with the chicken and vegetables. Bring the soup to a boil over high heat, then reduce the heat to medium-low, and simmer uncovered for 30 minutes, stirring occasionally. 3. Season the soup with hot sauce, salt, and pepper to taste before serving. The is a great winter night soup. Curl up and enjoy!